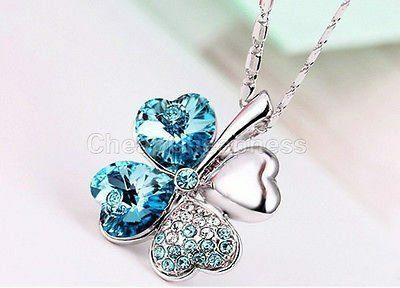 Silver Plated Crystal Lucky Clover Necklace Only $2.13 + FREE Shipping! You are here: Home / Great Deals / Amazon Deals / Silver Plated Crystal Lucky Clover Necklace Only $2.13 + FREE Shipping! Head over to Amazon and get the Silver Plated Crystal Lucky Clover Necklace for as low as $2.13. And, shipping is FREE! Choose from four colors – pink, blue, dark purple, and red. Be sure to check the price as they vary depending on the color of stones. These are a great stocking stuffer!